The U.S. military on Friday identified three of the four Americans killed in a suicide bombing in Manbij, Syria, earlier this week. 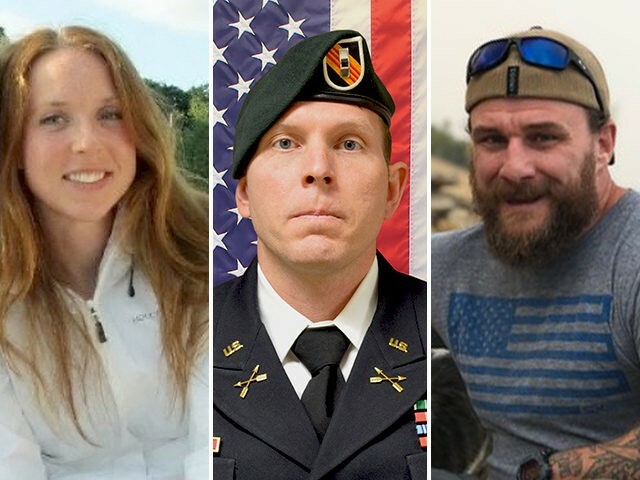 Those killed were Army Chief Warrant Officer 2 Jonathan R. Farmer, 37, of Boynton Beach, Florida; Navy Chief Cryptologic Technician (Interpretive) Shannon M. Kent, 35, of upstate New York; and DOD civilian Scott A. Wirtz, 42, of St. Louis, Missouri. They died Wednesday after a suicide bomber launched an attack outside of a restaurant in the northern Syrian town of Manbij. Also killed in the attack were members of the Syrian Democratic Forces, a local partner force that has worked closely with U.S. military forces to fight the Islamic State in Iraq and Syria (ISIS). ISIS claimed responsibility for the attack. Three other U.S. service members were injured in the attack, but their names have not been released. Farmer was assigned to 3rd Battalion, 5th Special Forces Group (Airborne) based at Fort Campbell, Kentucky; Kent was assigned to Cryptologic Warfare Activity 66, based at Fort Meade, Maryland; and Wirtz was assigned to the Defense Intelligence Agency as an operations support specialist. Wirtz was a former Navy SEAL. Some critics of the decision have pointed to the attack as proof that ISIS is not defeated, contrary to the president’s claims, and that he should not pull troops out from Syria. “My concern, by the statement by President Trump, is that you set in motion enthusiasm by the enemy we’re fighting,” Sen. Lindsey Graham (R-SC) said Wednesday at a hearing. The Obama administration first announced the deployment of fewer than 50 U.S. special operations forces to Syria in October 2015. That force has now grown to approximately 2,000. Trump has seen the purpose of U.S. presence in Syria as defeating ISIS, and with more than 98 percent of the physical territory taken back from ISIS, he has sought to bring U.S. troops home. The president first suggested U.S. troops were coming home in a tweet on December 19 that said, “We have defeated ISIS in Syria, my only reason for being there during the Trump Presidency.” The decision reportedly prompted former Defense Secretary Jim Mattis to resign. A week later, on December 23, he announced after a call with Turkish President Recep Tayyip Erdogan that U.S. troops were “coming home,” seeking to fulfill a campaign pledge to bring troops home from Syria. The men and women stationed at Al Asad have played a vital role in the military defeat of ISIS in Iraq and in Syria. Because of these gains, our service members in Syria can now return home to their families. Some will come here for a stay, but a lot of them are going to be going back home, where they want to be, with their families. Former Defense Secretary Jim Mattis signed an order on December 31 for U.S. troops to begin drawing down from Syria. On January 11, the U.S.-led coalition in Iraq and Syria announced that the U.S. had begun pulling out some cargo of Syria, but no troops yet. Over the past week, the president has been discussing more conditions of the planned pullout. On Sunday, January 13, the president said the pullout from Syria was starting, and that the remaining ISIS pocket in Syria was being hit hard, and pledged to “attack again from existing nearby base” if it reforms. He also threatened to “devastate Turkey economically” if it went after the Kurds, and mentioned “a 20-mile safe zone.” He reiterated that it was “now time to bring our troops back home.” “Stop the ENDLESS WARS!” he tweeted. On Monday, January 14, the president said he spoke with Erdogan about fighting the remnants of ISIS and the “20 mile safe zone.” There have been few details about the safe zone, but it appears aimed at preventing a clash between Turkish and SDF forces. Erdogan has said Turkey would administer the zone with logistical aid from the U.S. and other allies. Kurdish leaders have said they would not accept that, calling on the United Nations to administer it instead. Since the attack on Wednesday, January 16, there has been no indication the president has changed his mind about pulling out of Syria.